Music Critic gets his balls busted for KISS review. “KISS ROCKS VEGAS” Rocked the World! Music Critic Tony Bennett gets his balls busted for KISS review, and it’s not pretty. I have total respect for the profession known as “Music Critic” and though I may not always agree with their reviews, I always appreciate their perspective…assuming, of course, they have done their job professionally, accurately and objectively. It’s perfectly acceptable for a critic to not like a band, an individual artist, a song or even an outfit. However, that does not give that critic a license to kill. Each and every critic has a fiduciary duty to as accurately and objectionably as possible inform the public. Their opinions are absolutely acceptable and wanted, as long as they are defined as such and not written as facts and with malice. A review of the Wednesday night KISS concert in Duluth, MN by Tony Bennett for the Duluth News Tribune unequivocally reflects one of the most unprofessional, inappropriate, antagonistic and blatantly biased reviews I have ever read. Mr. Bennett clearly demonstrated in his “review” that he is not fit to be called a professional. His review read more like the rantings of a pissed off high school student than that of an educated, respectable journalism professional. His review opens with the line “It’s extremely uncool to like KISS…and if we’re being honest, the hate is pretty justified”. As a matter of reference, KISS is in the middle of doing 36 shows this summer across the United States in the span of 8 weeks – that’s basically a concert every other night for two months straight (yes, the band is off for Gene’s birthday August 25th). This tour marks their 43rd year selling out concert halls. Query: Mr. Bennett, did you get on the PA at the concert that night and tell the thousands that paid good money to see KISS that they are “uncool”? Did you then tell them you hated KISS and that they should too? Of course not, you waited until after the concert to litter your trash across the internet from the relative safety of your computer. That makes you a coward, plain and simple. I find it mind-boggling how Bennett translates “uncool” to “hate”. This behavior is obviously demonstrative of someone with a severely skewed perception of reality and a very altered understanding of the most rudimentary of human psychology. Let’s look at some of the other things Mr. Bennett had to say…. “…since the late 70’s, they’ve mostly trafficked in lecherous, brain-dead glam metal”. Query: Mr. Bennett, are you calling your readers that attended the concert “brain-dead”? If not, perhaps you could attend a few grammar courses and learn to more accurately, professionally and in a non-offending way, convey to your readers a clearer, complete thought. “…the “good stuff” – is often subpar (have you listened to, say, “Great Expectations” recently?” Comment: Mr. Bennett, you start your review off by telling your viewers you hate KISS. With that in mind, your “subpar” comment is completely void of validity because you clearly can’t be objective. As for “Great Expectations”, you clearly had none and you were going to be sure KISS wasn’t going to deliver (at least in your own, biased & unprofessional mind). “When you’re watching KISS, you don’t think about the times Simmons has made a fool out of himself.” Query: Mr. Bennett, you do realize that the idea of a concert is the to enjoy the concert experience and not the extracurricular activities of the individual artists correct? Do you want people to think about the times you have masturbated while they read your reviews? If not, then what purpose could your statement serve? There is absolutely no relevance to the job at hand (no pun intended). “…with simple rock songs holding it all together.” Comment: Mr. Bennett, I will accept this comment when you put on 40-50 pounds of gear, run around a stage for 2 hours constantly surrounded by intense heat from pyrotechnics, interact with 6,000 fans and all the while singing and playing guitar. You are once again showing complete disregard for your profession and an undeniable lack of respect for musicians. Yet, you are a “music critic”. Ironic. “After an opening set by painfully boring American Idol person Caleb Johnson…” Comment: Mr. Bennett, what exactly is “painfully boring”? You obviously have a bone to pick, a chip on your shoulder, a lack of respect for others, a gross misinterpretation of your job and above all absolutely no understanding of what it means to be a journalist. I would venture to guess you actually hate your job, at least based on what I have read. “Stanley…screeching out goofy intros to many songs in a bizarre Edith Bunker voice (How’s it sound out d’ere? )” Query: Mr. Bennett, does your employer offer any sensitivity training? You do realize Paul has a geo-accent like everyone else correct? You probably have one, as does your mother. Is making fun of his accent something your employer approves? Do you make fun of your readers accents? How do your readers feel about that? I think you are grasping at straws – your personal hatred for KISS is clearly inhibiting your ability to do your job. “…and thanking Duluth for putting the band in the Rock and Roll Hall of Fame (which, uh, could be disputed).” Comment: Mr. Bennett, I’ll chip in and help you here. There is this thing called a KISS Army – it’s made up of fans all over the world who take to social media, snail-mail, etc. and show support KISS. Without a doubt, some of the fine people of Duluth directly reached out in support of KISS being inducted into the Rock and Roll Hall of Fame (not to mention supporting KISS over the years buying records, merchandise etc). “After the fake Criss sang Criss’ hit song “Beth”” Comment: Mr. Bennett, you talk about Eric Singer and Tommy Thayer as “fake” because they wear the iconic makeup and costumes of the two previous original members (Peter Criss and Ace Frehley, respectively). Would you tell your children on a trip to Disney World that Mickey is “fake”? What about Mini Mouse…is she “fake”? KISS has never claimed Eric was Peter nor that Tommy was Ace. Bandmates may have changed but at no time was there any attempt to deceive the fans. You are once again using your media to spout out things that are simply not true. Again – VERY unprofessional. “…but he didn’t play with the same feel as his predecessor”. Comment: Mr. Bennett, you do realize that two different people will do the same activity differently correct? After all, these musicians are humans, not robots. Query: Do you actually expect two different musicians to play the exact same way? How did you ever get a job as a music critic? You CLEARLY are not qualified for the job. ” The band, seemingly, now exists solely as a capitalistic money-farming machine” Query: Mr. Bennett, if millions of people all over the world want to continue to pay hard-earned money to experience a KISS concert, buy KISS merchandise and in general want to be KISS’ed, doesn’t business 101 & supply & demand clearly dictate the appropriate path? Should Disney World close down in your mind? Maybe even the Duluth News Tribune should close up shop – but wait – wouldn’t that mean you would loose your job? You, Mr. Bennett, are ignorant. “Stanley often altered melody lines to accommodate his 64-year old voice”. Comment: Mr. Bennett, does your mother walk as fast today as she did when she was younger? Do you run as fast today as you did when you were 15? How in the world can you justify such a comment when millions of people all over the world are still happy to fork over their hard-earned money to hear Paul sing? You, once again, are illustrating your ignorance by grasping at straws in your feeble attempt of a review. Even though I am a KISS fan, every point I have made is 100% valid. I show no bias, take no liberties, make no false assumptions and clearly illustrate my thoughts. Music is subjective. However, within subjectivity lies accountability. It is my personal opinion that Tom Bennett should turn in his resignation, rethink if this profession is well suited for him, and if he thinks it is, go back to school and learn how to do it right (professionally). Additionally, the editor in Chief either didn’t read this review prior to publication or he/she is equally incompetent, inept and undoubtedly not worthy of his/her position within the Duluth News Tribune. This total and complete lack of professionalism is surely not what the subscribers and readers of the Duluth News Tribune signed up for, or deserve. Lastly, at the end of the day, I can’t help but wonder who has more money in the bank – KISS or Music Critic Tony Bennett. Actually, I don’t really wonder, it’s blatantly obvious. KISS wins, again! I was just one of millions of fans all over the world who not only couldn’t wait to see the “KISS ROCKS VEGAS” movie, I couldn’t wait to EXPERIENC it. Because, as we all know, everything KISS does they do larger than life, in your face, loud & proud, and bigger & better than anyone else ever has, or ever will. KISS, for 43 years and counting, is bar none “The Hottest Band in World”. “KISS ROCKS VEGAS” was filmed in Las Vegas during the bands 9-show residency at The Joint inside the Hard Rock Casino in November of 2014. As someone who was there when the band landed in the parking lot of the casino in a helicopter on opening night through the last fans chanting “WE WANT KISS, WE WANT KISS!” when the band left the stage after the last show, I can tell you “KISS ROCKS VEGAS” was as close to being there as you can get. It was the ultimate way to re-live the best concert I had ever seen. The amount of work and the number of people it took to pull of such a concert event is mindboggling. As each band-member points out during the interview segment of the movie, trying to bring in a stadium-sized stage and show into an intimate venue would be a huge undertaking, if at all even possible. Yet, in true KISS fashion, they not only did it, they blew away their own expectations. They hired the best set designers & builders, recruited the best light designers, sought out the best audio engineers, utilized the latest cutting-edge technology, planned, rehearsed and with great fanfare met their goal to do the impossible, yet again. While it’s common to have fans getting out of their seats screaming, playing air-guitar/drums, singing, clapping, chanting & applauding at a concert venue, it’s doesn’t happen in a movie theater…unless KISS is involved. On May 25th, 2016 all that and more was happening in theaters all over the world. It is truly a KISS world! “KISS ROCKS VEGAS” starts with a series of KISS factoids flashed on the screen, followed by an interview segment with each of the band members, then goes into the actual concert. During the interview segment, Gene, Paul, Tommy & Eric each discuss the challenges involved in this huge undertaking as well as tell some personal stories. The audience feels very connected to each member and this section really sets the tone for what was about to come. The concert was nothing shy of magnificent. It was everything you’d expect from a KISS performance and so much more. I can’t understand how for 43 years and counting a band can continue to out-do themselves at every turn but this is obviously standard operating procedure for KISS. Each member relentlessly gives 110% to be sure the fans are happy. Unlike so many other bands, KISS empathizes with the fans and realizes they spend their hard-earned money to see the best rock and roll show on the planet and they each feel a sense of responsibility to deliver that – and they do. It’s not just personal experience for the fans, it’s a personal journey for the band. “KISS ROCKS VEGAS” is another chapter in KISStory. And like every chapter so far, it exceeds all expectations, peaks all of the senses, and reminds you that the next chapter will be even better. KISS – The Hottest Band in the World. What is an anthem? Merriam-Webster says it’s “a formal song of loyalty, praise, or happiness”. While that definition properly suits most cases, when it comes to the Rock and Roll Anthem, aka “Rock and Roll All Nite” (by the Hottest Band in the World, KISS), that definition falls very short. 40 years ago, 4 guys wearing 8″ platforms and more makeup than your mother (credit to Gene Simmons for that phrase) were in New York City working on their 3rd album (Dressed to Kill) and it was suggested they write an anthem for the very genre they quickly came to redefine and dominate, Rock and Roll. The idea was to create a song that would in and of itself represent all that the music stood for. In other words, if you had to sum up what Rock and Roll was all about, listening to this song would do the trick. Gene Simmons & Paul Stanley got together and did just that. The year was 1975. 40 years later, “Rock and Roll All Nite” has endured as THE Rock and Roll anthem. It was initially released on April 2nd 1975 via Casablanca records and was produced by Neil Bogart and KISS. The song was originally recorded by Gene Simmons, Paul Stanley, Ace Frehley and Peter Criss. KISS has recorded several versions of the song (1 studio, many live) which have appeared on 18 KISS albums/DVD’s and the song was most recently featured in the “Scooby-Doo! and Kiss: Rock and Roll Mystery” movie (released July 10, 2015). In 2008 it was named the 16th greatest hard rock song of all time by VH1. What makes a great song and what makes a great anthem are two different things. However, you can’t have the latter without the former. A great song has a melody you can’t get out of your head, lyrics that resonate with the listener, a beat you find yourself moving to and that magical something that can instantly turn a bad mood into a great one the moment the song starts playing. A great anthem is all of that yet so much more. An anthem is somewhat like a corporate mission statement. It doesn’t represent just an idea, it represents and defines a path for an entire philosophy. “Rock and Roll All Nite” clearly not only meets that objective, it eclipses it. There are numerous songs that are considered staples in Rock and Roll. However, when you ask virtually anyone on the planet which one song best represents what Rock and Roll is all about they will undoubtedly say “Rock and Roll All Nite by KISS“. Simply stated, there is no other song that properly epitomizes or even closely exemplifies what Rock and Roll is all about. The genius of “Rock and Roll All Nite” is that the message is clearly yet succinctly stated (lyrics) and the vehicle by which that message is delivered (KISS) is truly larger than life. These two distinct properties coalesced resulting in a newly-defined perpetual masterpiece. It would become KISS‘s magnum opus. For Gene Simmons and Paul Stanley, the song’s title was an obvious one “Rock and Roll All Nite”. It summed up exactly what they were all about – being the band they always wanted to see (credit to Paul Stanley for that phrase). The second lyrical phrase in the chorus “and party every day” is a brilliant phrase not just because the statement naturally expands the predecessors message and not just because those that “party” in the traditional sense can relate to it, but because anyone can relate to it. “Party every day” means different things to different people – but the very nature of the phrase in this context is about continuing the journey experienced during the concert throughout the next day. In other words, the excitement doesn’t have to stop at the end of the night. You can embrace it as part of your daily life. While the lyrics can be interpreted many ways, the song is about a movement, a state of mind, a way of life and a celebration of all of the above. As for the music itself, it is beautifully simplistic in structure (rooted to the 1, 4, 5-7) yet is brilliantly accented and carried with a rolling bass line throughout that completely supports and compliments the melodic structure of the lead vocals (bass guitar and lead vocals by Gene Simmons). The chorus of any great anthem represents the very foundation of your soul. It’s the icing on the cake (Gene loves sweets so I wanted to throw that in there just for him). “I wanna Rock and Roll all nite, and party every day”. So simple, yet so right. 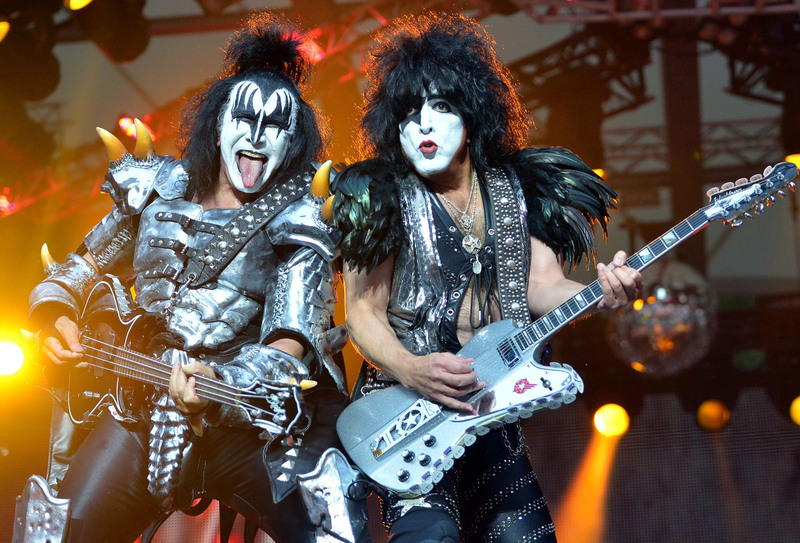 “Rock and Roll all Nite” is the song every KISS fan can’t wait to hear live. It’s usually the last song of the show and therefore it’s a bitter-sweet experience. However, the song is so powerful and the energy and heart KISS puts into playing it live make every audience feel like they are a part of the concert – as if the audience was on stage performing it with KISS. 64,000 people nightly are singing along, playing air-guitars and drums, clapping, screaming, cheering and are one with the hottest band in the world. In sporting events, the National Anthem is performed at the beginning of the event which gets the audience and both teams excited and pumped up for what is yet to come. With one team usually winning a game, playing the National Anthem at the end of the event when 1/2 of the audience just had their team lose the game would not be nearly as exciting or effective. It simply wouldn’t work. Conversely, every audience member at a KISS concert is first treated to the ultimate two-hour Rock and Roll show and therefore when KISS plays “Rock and Roll All Nite” as the encore, every single person in attendance is celebrating as they have ALL just won the Super Bowl of Rock. There are no losers at a KISS concert. And, when KISS finishes “Rock and Roll All Nite” & thus the concert, each member of the audience is probably as tired and yet equally as energized as the 4 guys on stage who just spent two hours giving them everything they had (not to mention doing this while running around a huge stage blasted with hot lights, fog, explosions, fireworks and all while wearing 30-50 pounds of costumes/gear). This is the essence of why KISS and their “Rock and Roll All Nite” anthem have endured and why KISS will live on long after Gene and Paul stop performing. Thank you, Gene and Paul, for creating this quintessential anthem and thank you to each and every KISS member past (Ace Frehley, Peter Criss, Eric Carr, Vinnie Vincent, Mark St. John, Bruce Kulick) and present (Gene Simmons, Paul Stanley, Tommy Thayer, Eric Singer) that has had the privilege of performing this prodigious piece of art. For 40 years, fans all over the world “keep on shoutin’ I wanna Rock and Roll all Night, and party every day” and they owe it all to you.